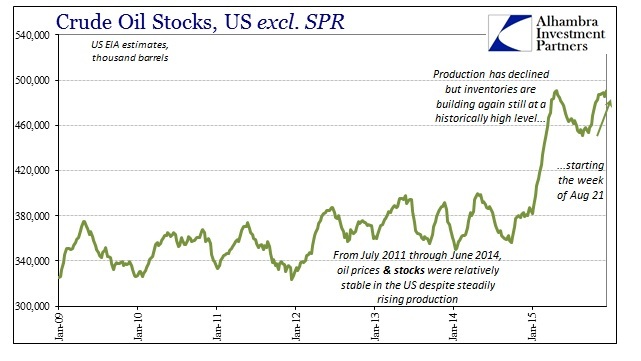 Like industrial production, the condition of oil inventory in the US was updated today in contradiction of the expectations driving Federal Reserve models expecting “transitory” weakness to simply pass into history. Unlike the virtual conditions for the FOMC, crude oil markets are obliged to respect both the eurodollar and the physical realities of physical commodities. 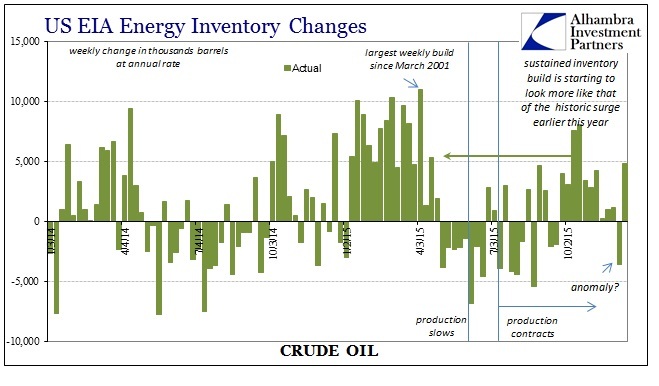 Last week, the US EIA reported a significant drawdown of inventories (about 3.5 million barrels) only to find a greater build this week (4.8 million barrels). 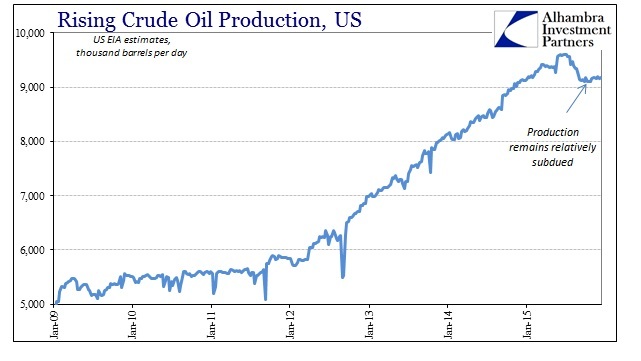 That leaves the amount of crude oil currently sitting in US storage as basically same as the all-time high registered in April – back when this sort of physical imbalance was last declared so temporary. While we hear constantly the drumbeat of supply, the trend in oil production has been entirely predictable; even since summer there is little variability in the trend now at a lower production rate. That leaves but oil demand and usage as the primary variable to have so shifted since last year. While, again, that is being classified as unimportant or “transitory”, somehow it conforms quite well with the disaster in industrial production (energy being a primary input in those segments) now indicating full, economy-wide recession. More concerning, and placing a great deal more pessimism into the economic mix, is that no matter how low oil prices have collapsed it doesn’t seem to have generated the expected inventory reversal; quite the opposite, the amount of crude in storage appears quite inelastic, as economists reference it, to price. That would seem to violate the basic laws of supply and demand in at least the ceteris paribus manner in which they are analyzed and totaled up as “transitory.” In other words, if the economy was continuing robustly despite the oil slump, those low prices should be quite enough for economic demand to start using much, much more of it. Instead, again, inventories appear inelastic to price which more than suggests that “demand” is weak and weakening unrelated to the price of oil. 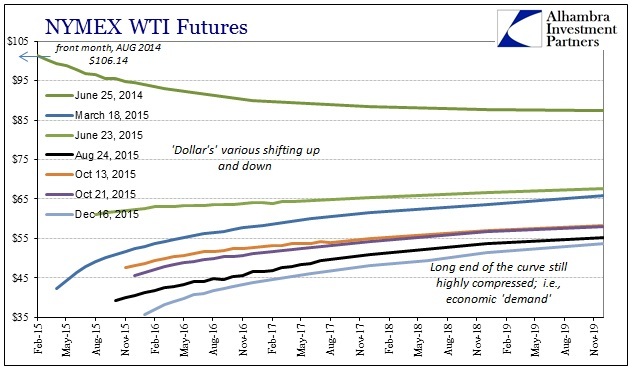 When crude inventories reached their peak in late April, the price of the January 2016 futures contract was around $63. Now that inventories are back at nearly the same level, with production significantly lower, mind you, the January 2016 contract is trading at below $36. In other words, if you bought January delivery expecting Janet Yellen’s tale of eventual sunshine to be true you lost huge – no matter the price, demand never showed up. Thus, crude oil inventories are signaling demand very much like estimates for industrial production, transportation and even the retail industry. The “slump” in the economy is therefore real, having been demonstrated in this one physical component at least. If demand does not pick up despite a huge reduction in price, then demand is constrained by serious economic deterioration. 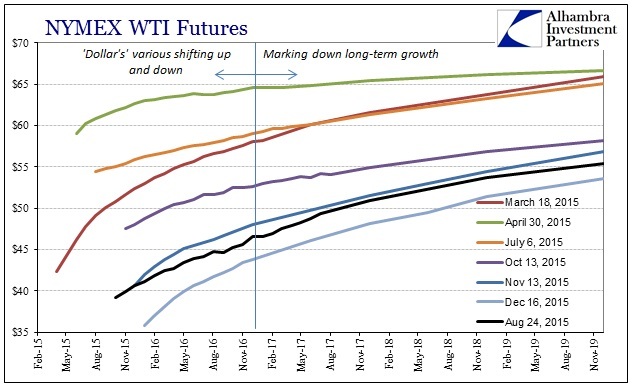 That seems to be the dominant setting in terms of WTI pricing, as the entire WTI futures curve has collapsed – not just the contango pressures of the “dollar” in the front end. 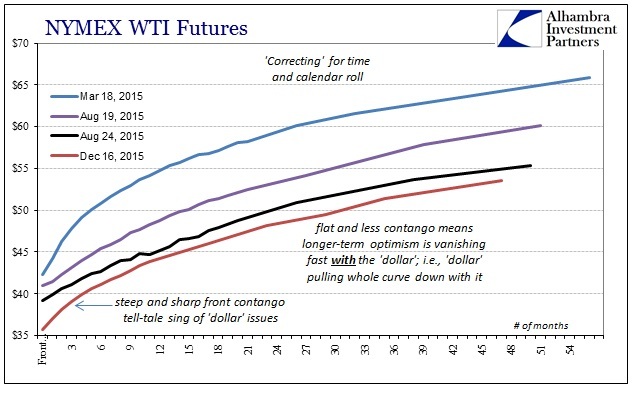 The back end contango has withered, too, meaning economic optimism upon storing oil for a lengthy period to “wait out” any transitory oil price slump or even temporary economic weakness flowing to demand has all but ceased. The December 2017 contract which had been trading around $57 for most of July and August up until the global liquidations on August 24th has slumped to just $48 today. The “dollar’s” impact on the front has pulled the whole crude complex down with it – demand following finance. As bad as the world looked on August 24, for crude oil, the vital lifeblood of the economic engine, actually looks much, much worse right now. That offers quite the juxtaposition with Janet Yellen and the FOMC proclaiming their modeled econoimc expectations their only basis for economic expectations. The physical economic world has been turned durably and seriously against that. In other words, regressions for the potential track of the recovery suggest a world that couldn’t already apply given these very real circumstances. 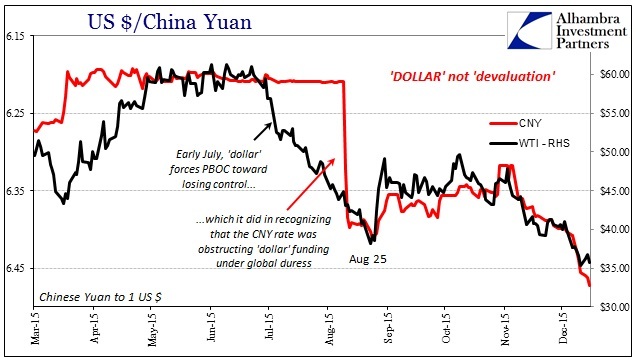 From that point, the “dollar” and commodity prices, being forward-looking, suggest there is much more downside to yet come.